Welcome to the Samhain Blog Hop. If you have just arrived from Carolyn's contribution, thank you for stopping by. You can jump back onto the blog hop train and continue your journey by clicking on the link to Amethyst's blog at the end of this article. Samhain is an ancient Celtic festival that was celebrated on the first day of November and marked the beginning of winter and also the Celtic New Year. As you can imagine, in the olden days this would be a dark and cold time; no wonder our ancestors would be thinking about death, ghosts and sheer survival during the harsh winter months ahead. Today, we celebrate Halloween on the eve of the 31 October, which nowadays marks the start of the party season up to Christmas. But if you would like to commemorate Samhain in a more contemplative way, then this year you may want to explore your dark - shadow - side, and what better way to do it than with a Tarot deck? It's that aspect of your personality you prefer to keep hidden. Weaknesses you'd rather ignore, blocked personality traits you dislike or may be seen as inappropriate by society; desires, fears, secrets, latent talents, suppressed emotions, your dark side. 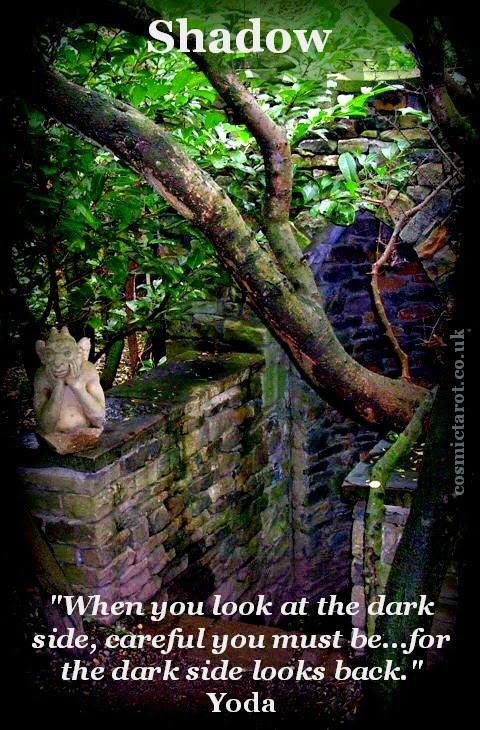 At Samhain, the evening of Halloween, prepare to meet your Shadow and face it. Uncover and explore your hidden and true self. Acknowledge it, embrace it, make friends with it, release it or turn it into something positive. For example, if Scorpio is your sun sign, then Taurus is your opposing zodiac, and the Hierophant is your shadow card. 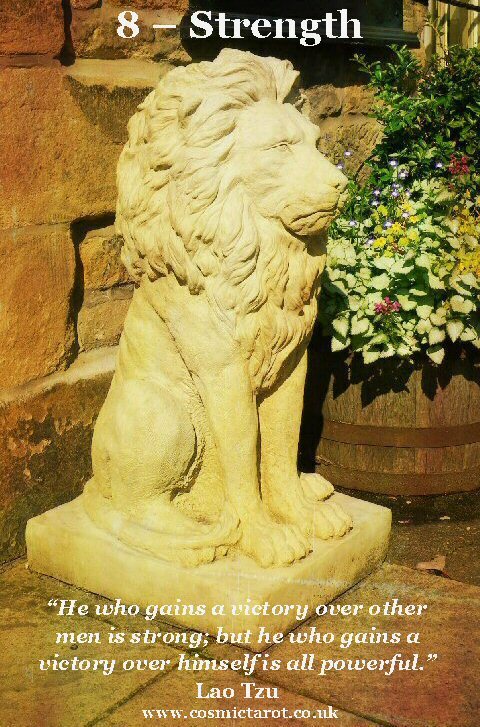 What does it say about your hidden personality, your fears, weaknesses and so forth? Explore the challenging aspects of the card. Which ones resonate with you? Your Shadow is uncharted territory. And just like real shadows, it fluctuates, changes shape, becomes larger or smaller. 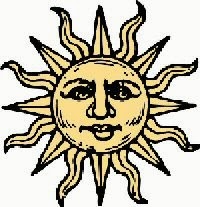 Different shadow aspects come through at different times and in different situations. For your Samhain exploration, pull two more cards that will focus on a particular aspect in relation to your zodiac shadow card and a task that may help you overcome or at least integrate that aspect into your life more comfortably. 2. What particular aspect do you need to focus on at this moment in time? 3. What can you do to make a positive change? As a Pisces, my shadow zodiac card is the Hermit, which is also my personality card. 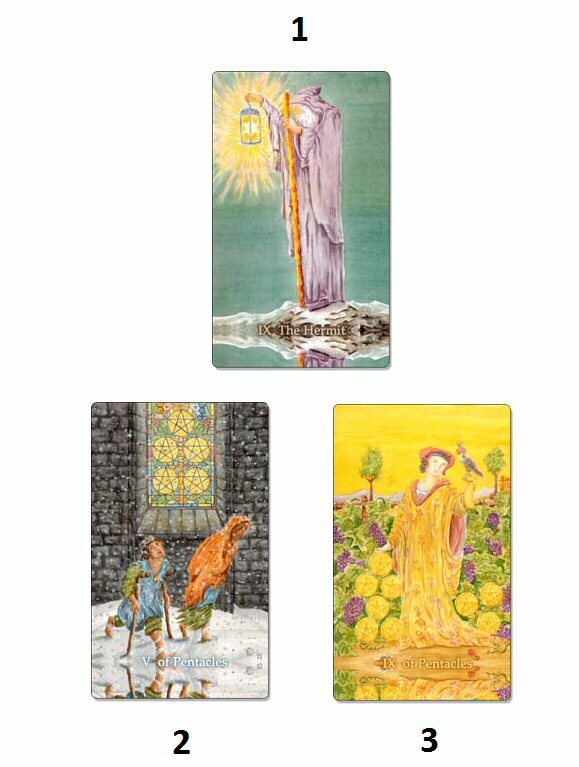 What do these cards reveal to you about me that I would rather keep hidden? Have fun exploring your Shadow and dark side with this simple spread. Thanks for being here. Please enjoy more Samhain / Halloween explorations by visiting Amethyst's blog, and before you go, please consider subscribing to my feed. It's full moon in Taurus tonight, and I dare to admit that I've nearly missed it! Trying to combine half-term holidays and Halloween preparations with a busy workload is my lame excuse, but here we are, at that dark time of the year, when Scorpio's intense emotions and transformational powers are kept in check by down-to-earth Taurus. Since it is Halloween in two days time, I have chosen the zodiac card images for today's post from Ian Daniels' Tarot of the Vampyres; Death (Scorpio) and the Hierophant (Taurus). 2012, the year of the Hierophant, is soon coming to an end, and according to the Mayan calendar a new era is beginning on the 21 December. 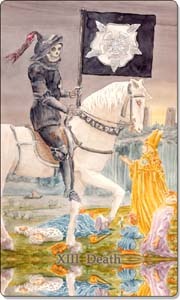 Scorpio is the sign of transformation, so it is an apt match with Death as its Tarot zodiac card. Scorpio/Death as the current sun sign influence may encourage a strong urge within ourselves to follow our primal needs and emotions, which can indeed bring about long-lasting changes and an unsettling time ahead coming to terms with the new order we are creating. Tonight, the energy of the Taurus full moon, the Hierophant, will help us determine, if we want to go all the way into an unknown, risky, adventurous direction or stay as we are, in a secure but unexciting comfort zone. But the Taurus/Hierophant energy is not entirely a killjoy; it may prevent you from making choices that are completely mad, bonkers and regrettable in a few months time. 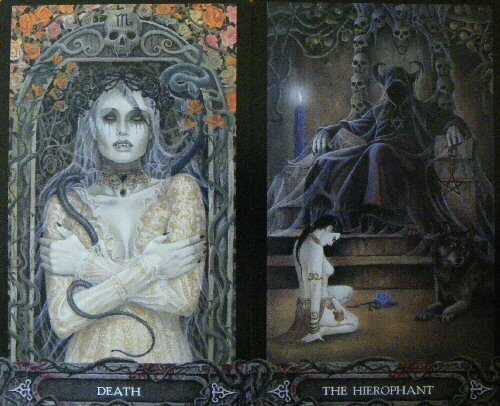 Whatever direction the Death/Hierophant energies are taking you over the forthcoming 24 - 36 hours, they will most likely be for the best. 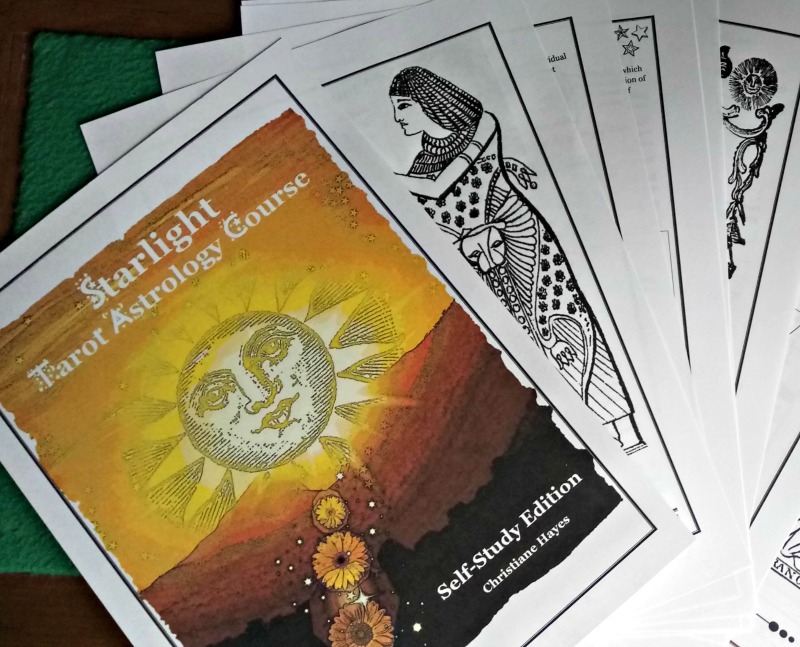 Learn more about Tarot and Astrology with my Starlight Tarot Astrology Course. The Wheel of Fortune is relentlessly spinning throughout our lives. Sometimes we're in luck, at other times we need to deal with a misfortune. Most of these events seem to be out of our control, but quite often we will have done something beforehand, perhaps unknown to us, that will have led to the Wheel of Fortune moment: cause and effect, karma. In a few non-traditional decks, the Wheel of Fortune is represented by a fortune-teller; the unknown future can be scary when you want to stay in control. 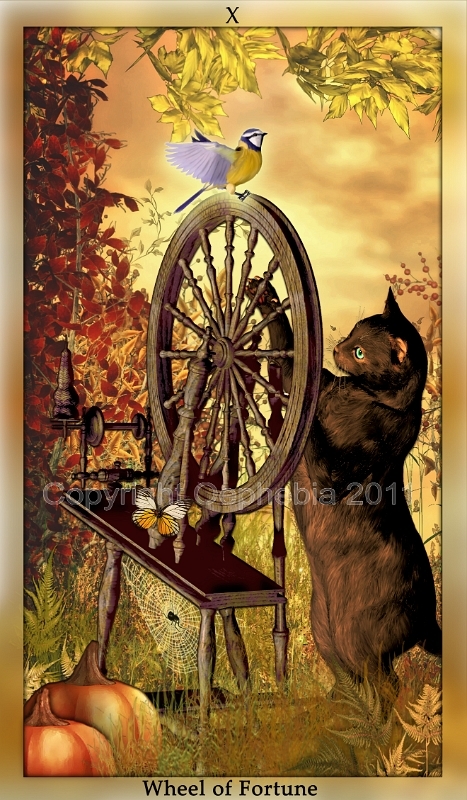 The Wheel of Fortune in the Animalis Arcanum Tarot by Oephebia is a delightful image of a cat, whose curiosity and playfulness leads her to spin the Wheel. She's probably also keen to catch the bird, which no doubt will fly off any moment having already spotted the little predator. 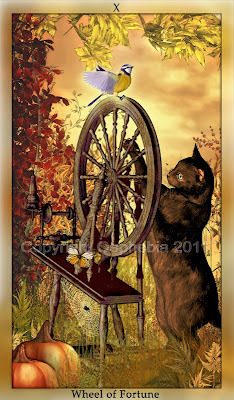 The cat is unaware of having set the "wheel in motion"; the bird flies off, just when the cat is about to pounce and in that movement may even knock over the wheel. The cat, unaware, has taken fate into her own "paws", and in a reading, the Wheel of Fortune may suggest that you need to do the same. When this card comes up, why not spin the Wheel? Ask yourself, what can you do or change, even just for a month or so, that might have a big, positive, nurturing impact on your life? Of course, when we cannot find an explanation for an unexpected event that has long-term consequences, it often seems that higher forces beyond our control influence our lives. In that moment all we can do is control our reaction to it. Whatever fate has in store for you, it's up to you to make the most of it. Oephebia's Animalis Arcanum Tarot is a visually attractive deck-in-progress with a wealth of symbolism and the presence of animals on each card. 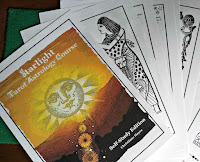 The Major Arcana is nearly completed. Take a look at the other beautiful images on her website: Animalis Arcanum Tarot.